For the past twelve years this routine has been the opening act of Paul's Mentalism Show, both land and cruise ship work. This book details the original method plus the updated method and equipment used. The book also explains a solo version that Paul uses in more intimate situations. This book also gives Paul's word for word routine, complete with gags and bits of business making this a COMPLETE package. 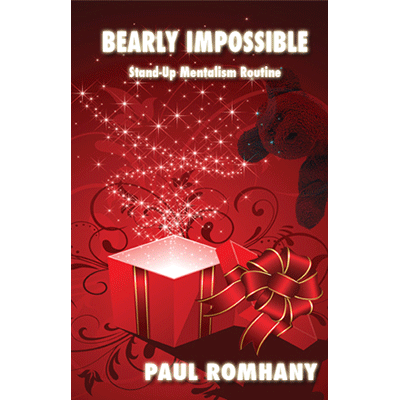 BONUS ROUTINES: As a bonus Paul shares THREE different effects that use Teddy Bears including a Paper Balls over the Head Production and another highly commercial stand-up bear routine plus a great Bear Routine for kids performers. "There is something very endearing about using a Teddy Bear in a show - especially if you end up giving it away. This is one of my all time favourite routines to open my show as it immediately gets the audience on my side and prepared for the rest of the show." THE EFFECT: The performer shows a gift box, and talks about how he bought this gift for his four-year-old niece for her upcoming birthday. He then talks about 'coincidences' and wants to try an experiment. Audience members are asked to call out any color, any amount of money, a ladies name and a 'gift' is selected. The selections are written on a whiteboard. The lady is invited on stage and SHE TAKES OUT of the gift box a birthday card addressed to the magician's niece whose name matches the one called out ... coincidence ONE. She then takes out a gift certificate for the EXACT amount that was called out ... coincidence TWO ... she then reaches in and takes out the gift which matches her choice AND it is the exact color that was called out. The color, money, name and gift ALL MATCH 100%. Also, the SPECTATOR takes out the items from the gift box.